Merry Christmas to you all from Pennsylvania. This may be the first candlelit tree I’ve seen in person. We glimpsed it last night after the Moravian service in Lititz, Pennsylvania. This has been a holiday filled with singing. Tonight I am hoarse from an impromptu evening of carols and songs around the family table. Briefly, it felt like we were in another era – a time of candelit trees and pump organs. But some around the table were finding lyrics on smart phones. Two worlds blended on this Christmas night in a still-young century, and it felt good. Very good. Newer Post Wings	Older Post Hello Winter. Thankful. Loved the tree. Merry Christmas. 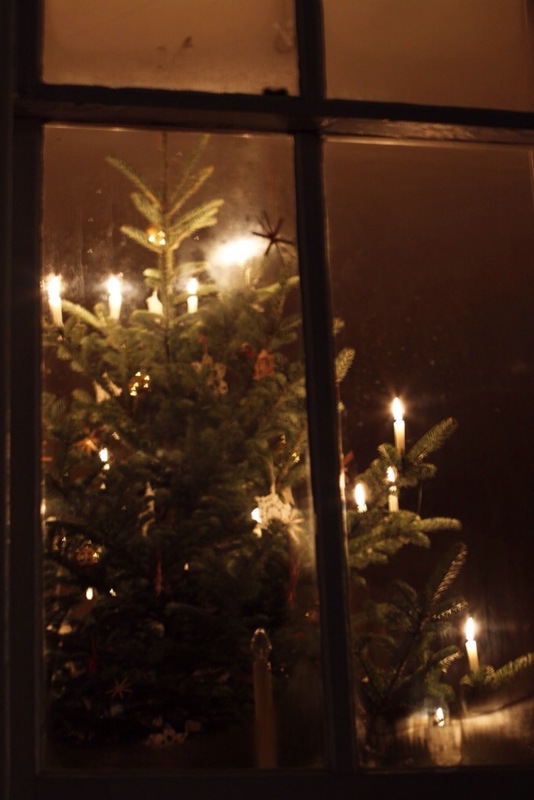 With love to all of you, Glædelig Jul from Denmark! sounds like a wonderful cozy night- and thank goodness for the iphones – how would anyone know the words without them? our family usually needs to mutter through half the songs- which i’m okay for all the laughs that produces 🙂 hope your holidays were happy! Greetings fellow Pennsylvanian! And Merry Christmas! So beautiful – the story and the photograph. There’s something so magical about moments that bring us back in time, even to a time we never lived. Loved this! Thanks Caitlin! Gotta grab these fleeting moments when we glimpse them. Happy New Year! De rien! Tu parles francais couramment? Mais non! Je ne suis pas Français. Êtes-vous? Oui, en partie, c´est ma langue maternelle. Vous parlez francais depuis longtemps? Hi Jeanne-no I’m not Moravian, but grew up in a community in Pennsylvania with many Moravian people (not far from Bethlehem, PA). This was my first experience of a Moravian Christmas Eve. Lovely!